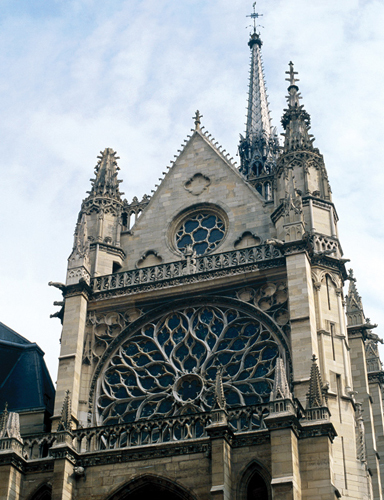 This Gothic masterpiece, built by Louis IX (1214– 70) as a shrine for his holy relics of the passion and completed in 1248, is considered the most beautiful church in Paris, not least for its 15 stained-glass windows soaring 15 m (50 ft) to a star-covered vaulted roof. The church was damaged during the Revolution but restored in the mid-19th century. Admission €8 (free 1st Sun of month Nov–Mar); €11 joint adm to Conciergerie. Temporary exhibitions are €1.50 extra. Ticket sales stop 30 mins before closing. 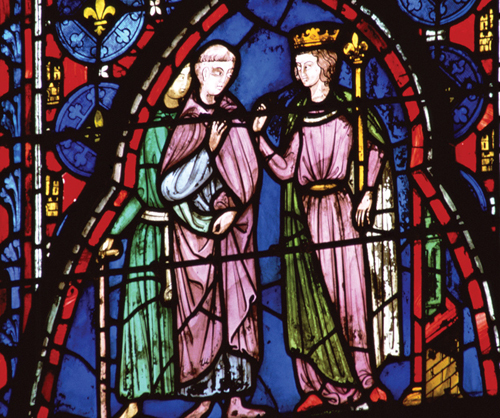 The devout Louis IX, later St Louis, was the only French king to be canonized. While on his first Crusade in 1239, he purchased the alleged Crown of Thorns from the Emperor of Constantinople. 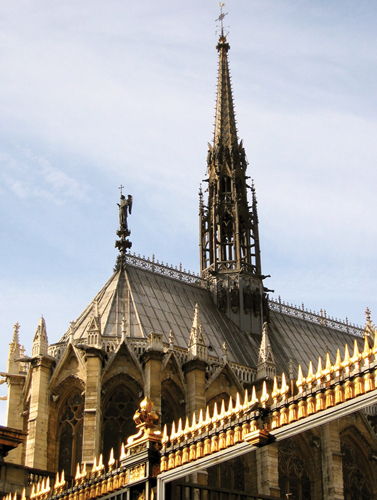 He subsequently acquired other relics, including pieces of the True Cross, nails from the Crucifixion and a few drops of Christ’s blood, paying almost three times more for them than for the construction of Sainte-Chapelle itself. 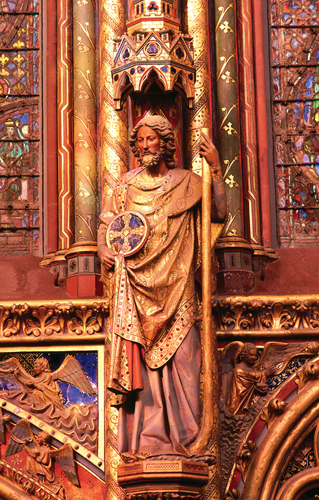 The relics now reside in Notre-Dame. For a little 1920s-style elegance, try Brasserie des Deux Palais on the corner of boulevard du Palais and rue de Lutèce. A pair of binoculars comes in handy if you want to see the uppermost glass panels. As you emerge, via a spiral staircase, into this airy space, the effect of light and colour is breathtaking. 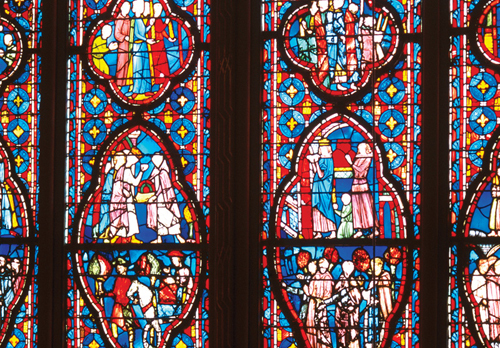 The 13th-century stained-glass windows, the oldest extant in Paris, separated by stone columns, depict Biblical scenes from Genesis through to the Crucifixion. To “read” the windows, start in the lower left panel and follow each row left to right, from bottom to top. The Flamboyant-style rose window, depicting St John’s vision of the Apocalypse in 86 panels, was replaced by Charles VIII in 1485. The green and yellow hues are at their brightest at sunset. Located above the apse, this stained-glass depiction of the Crucifixion is the chapel’s most beautiful window. Beautifully carved medieval statues of 12 apostles stand on pillars along the walls. Badly damaged in the Revolution, most have been restored: the bearded apostle, fifth on the left, is the only original statue. 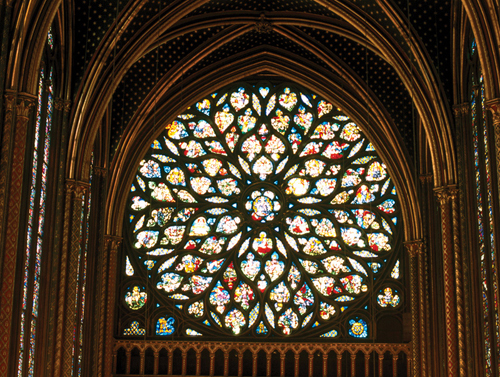 Another striking window, this tells the story of St Helena and the True Cross and of St Louis bringing his many relics to Sainte-Chapelle. The open latticework and pencil-thin shape give the 75-m (245-ft) flèche (spire) a delicate appearance. Three earlier church spires burned down – this one was erected in 1853. Like the Upper Chapel, the main portal has two tiers. Its pinnacles are decorated with a crown of thorns as a symbol of the relics within. In the late 14th century Louis XI added an oratory where he could attend Mass unobserved, watching through a small grille in the wall. The chapel originally adjoined the Conciergerie, the former royal palace on the Ile de la Cité. During Mass, the royal family sat in niches located in the fourth bays on both sides of the chapel, away from the congregation. 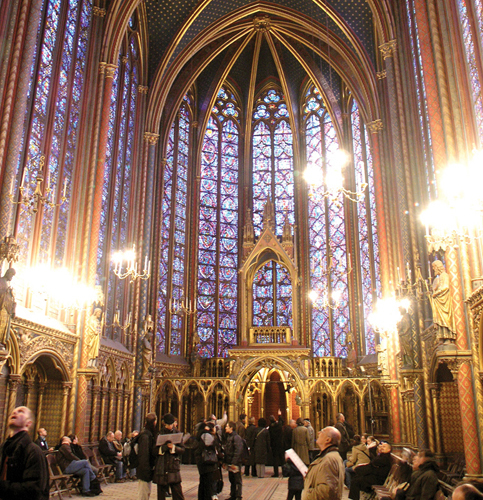 Sainte-Chapelle has excellent acoustics. From March to November classical concerts are held here several evenings a week.